Looking for Jazz RealTracks and RealDrums? PG Music makes it easy with Jazz RealPAKS 1-15! Jazz RealPAKs 1-15 include a collection of PG Music's popular RealTracks and RealDrums for Jazz. These are not samples, but full recordings by professional musicians that replace the MIDI track in your arrangement and play along in sync to the chord progressions you enter. RealTracks Set 306: Tango and More! Includes 61 Jazz RealTracks in Sets 264-269. RealTracks Set 264: Crooner Bossa Big Band! RealTracks Set 265: Crooner Ballad Big Band! Includes 71 Jazz RealTracks in Sets 236-244. RealTracks Set 236: Cocktail Jazz Horns! RealTracks Set 240: Straight Ahead Funk! RealTracks Set 241: Swingin' Funk! RealTracks Set 242: Praise Break! Includes 33 Jazz RealTracks in Sets 214-220. Includes RealTracks Sets 194, 195, 196, 197, 198 & 199. Requires Band-in-a-Box® 2012.5 or higher. **Note: Requires Band-in-a-Box® 2012.5 or higher. This includes 6 RealTracks Sets (over 25 RealTracks instruments). RealTracks Set 194: Jazz Pollwinners 1 &dash; Great Saxes: Phil Woods & Gary Smulyan. RealTracks Set 195: Jazz Pollwinners 2 &dash; Pat Martino Guitar. RealTracks Set 197: Jazz Pollwinners 4 &dash; Killer Bossa Rhythm Sections. RealTracks Set 198: Jazz Electric Piano. RealTracks Set 199: Jazz Pop Piano. Requires Band-in-a-Box® 2011 or higher, except Set 176 which requires 2012.5 or higher. RealTracks Set 176: R&B Horn Section. Baritone Sax, Tenor Sax, Trumpet. RealTracks Set 177: Guajira & Guaracha. Bass, Piano and Tres. RealTracks Set 178: Dixieland - Medium Soloists. Clarinet, Trombone, Trumpet and Acoustic Guitar. RealTracks Set 179: Guitar - Jazz and More! Acoustic Guitar. RealTracks Set 180: Classic Jazz Piano. Jazz Piano. RealTracks Set 181: Smooth Jazz Piano. Acoustic Piano. Requires Band-in-a-Box® 2011 or higher, except Set 163 which requires 2012.5 or higher. **Note: Requires Band-in-a-Box® 2011 or higher, except RealTracks Set 163 which requires 2012.5 or higher. RealTracks Set 160: Jazz-Funk Movin'. 2 Electric Guitars, 2 Electric Basses, 2 Electric Pianos, and Tenor Sax. RealTracks Set 161: Mike LeDonne Jazz Waltz Organ. 4 Rhythm Organ, and 2 Soloist Organs. RealTracks Set 162: Dixieland - Medium Rhythm Section. 3 Tenor Banjo, Acoustic Guitar, Acoustic Piano, and Tuba. RealTracks Set 163: Son Montuno. 2 Baby Bass, Acoustic Guitar, 2 Acoustic Piano, and Tres. RealTracks Set 164: Bolero. Baby Bass, 2 Acoustic Guitar, 2 Acoustic Piano. Includes RealTracks Sets 143, 144, 145, 146, 147, & 148. Requires Band-in-a-Box® 2011 or higher. **Note: Requires 2011 or higher. Includes RealTracks Sets 127, 128, 129, 130, & 131. Requires Band in a Box 2011 or higher except for Set 130, which requires 2011.5 or higher. **Note: Requires Band-in-a-Box® 2011 or higher except for RealTracks Set 130: Mike LeDonne - More Swingin' Piano & Organ which requires Band-in-a-Box® 2011.5. Includes RealTracks Sets 109, 110, 111, 112, 113, 114 & 115. **Note: RealPAK Jazz 5 requires Band in a Box 2011 or higher. Includes RealTracks Sets 90, 91, 92, 93, 94 & 95. 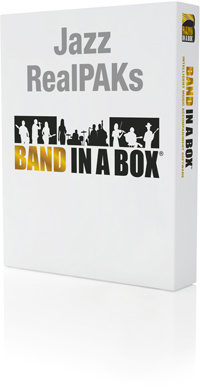 **Note: RealPAK Jazz 4 requires Band in a Box 2010.5. Includes RealTracks Sets 72-77, and Jazz RealDrums Set 28, with additions like Ballroom Latin, Swing 16ths Hip Hop, and more! Includes RealTracks Sets 50-58, and Jazz RealDrums Sets 23-24, with Bossa, Jazz Swing, additions like the Flute, Bossa Guitar, Acoustic Piano, Brushes, HiHat, and more! Jazz Older Waltz 4s, Jazz Older Waltz, Jazz Waltz Terry Clarke with RealDrums Set 24: Jazz Waltz. Jazz Older, Jazz Older 4s with RealDrums Set 23: Classic Jazz. Includes RealTracks Sets 7, 13, 14, 15, 16, 17, 18, 19, 28, 29, and the Jazz RealDrums from Sets 1-20. Acoustic Jazz Bass, Bossa Rhythm Section, Jazz Guitar Comping, & more! Acoustic Rhythm Guitar with RealTracks Set 29. Jazz: Busy, Cool, Dance, Easy, Funk, Hard, Lite, Down-tempo, Quick, Relaxed, Samba, Smooth, Slow, Upbeat, Up-tempo with RealDrums Set 20. Jazz Brushes, Jazz Waltz with RealDrums Set 19. Bossa Brushes, Jazz Brushes with RealDrums Set 18. Fusion (Busy, Even 8, Funk), Jazz (Modern, Even 16) with RealDrums Set 17. Bossa Brushes, Jazz, Pop, Rock, Fusion, Even 8, Swing with RealDrums Set 11. Bossa Brushes (Full, Perc, Swing), Jazz Even 8, Jazz Swing with RealDrums Set 10. ChaCha, Mambo, Rumba, Salsa, Samba, Tango with RealDrums Set 5.